On Sunday morning of the 23rd January 1944 a Halifax aircraft number LK704 of 518 Squadron took off from the air base at Tiree, Scotland on a Meteorological Reconnaissance flight over the North Atlantic Ocean. Reliable weather information was a most important part of planning patrols that provided protection to the Allied shipping convoys bringing supplies from America and Canada to Britain. This information was so important that no matter what weather conditions were like the air craft went out on their missions. The book titled, “Even the Birds Were Walking”, by John A. Kington & Peter Rackliff, tells how the patrols went ahead when even the birds stayed on land. Peter Rackliff had first hand experience of the conditions for on several occasions he had flown on LK704 with some of the crew who were aboard on 23rd January 1944. Not long after taking off the Halifax lost radio contact with its base in Tiree. The next recorded details of the plane were at 18-12 hours when it was heard to be moving in a southerly direction in Co. Donegal. It crashed shortly afterwards on Roguey Cliff near Bundoran. Weather conditions were very poor with high seas running. Two ladies Miss Murtagh and Miss Geoghegan, the manageress and assistant manageress of the Great Northern Hotel, Bundoran where out walking shortly after 6-pm when they heard the air craft flying low over head. The following is an extract from the official report on the crash submitted to the Free State Authorities by Comdt.F.R.Power “I have the honour to submit my report on the crash of Halifax air craft number LK704 of 518 Squadron that crashed at Tullan Strand, Bundoran on 23rd January 1944 at 6-20pm. All 8 members of the crew were killed – 6 of the bodies were recovered and handed over with personal effects to the R.A.F. at the border near Belleek. The names of the crew were as follows:- W/O L.J. 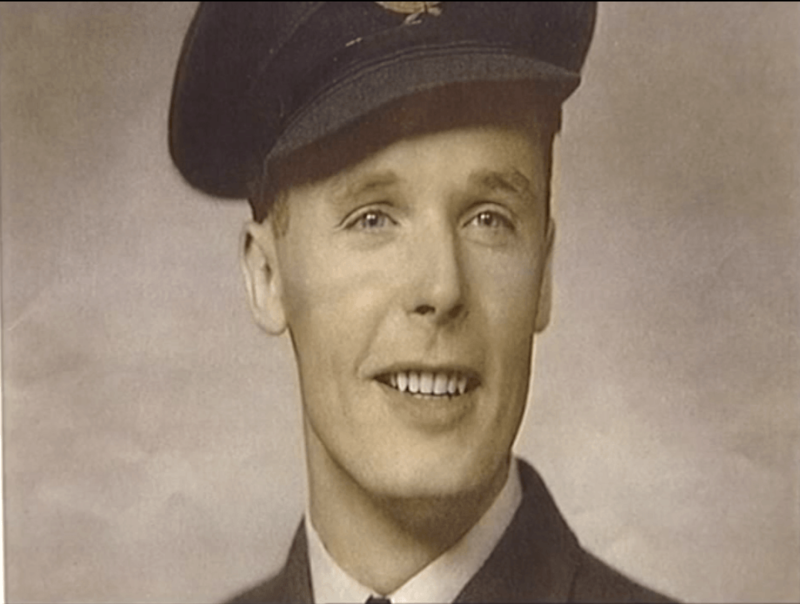 Upshall, RCAF, Pilot. F/0 Fred E. Dawson, RCAF, F/0 Vladimir, RCAF, W/O Frank Ash, RAF, Sgt. D.P. Hewitson, RAF, Sgt. F.C.E. Hussey, RAF, F/ 0 C.L. 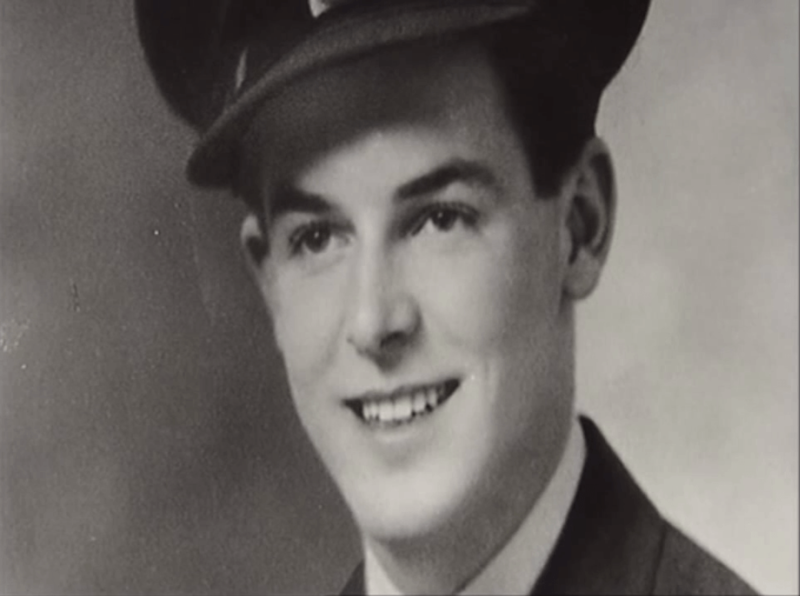 Scott, RCAF, P/ O. N.G. Growski U.S. born member of the RCAF”. The bodies of the last two were washed out to sea and never recovered. The bodies of Upshall, Dawson and Adamic are buried in Irvinstown, Co. Fermanagh. The bodies of the three RAF men were returned to England for burial. Herewith is report from Capt. Birthistle who visited the scene of the crash. “I have the honour to submit report on the above Plane crash. I interviewed two eye witnesses of the crash, Miss Murtagh and Miss Geoghegan, Manageress and Assistant Manageress of the Great Northern Hotel. At about 18.15 hours these ladies were walking on the cliffs at the end of the Golf Links when a plane passed over them flying very low and proceeded to just top the high waves and disappeared out to sea; they did not notice the plane turn. They next saw it about 100 yards away and coming straight for them (18.20 hrs. ), they screeched in terror but were unable to move; the plane crashed on the top of the cliff breaking into small pieces, the lower portion of the body and tail fell over into the sea, which was running very high at the time. Miss Geoghegan rushed to the wreckage which was approx. 50 yards from her, and pulled out one of the crew who was dead. She was then joined by Miss Murtagh and dragged a second man out of the wreckage who was alive but this man died in a matter of minutes. They dragged two further men from the wreckage; these men were dead. They were unable to get the remaining two out as they were caught by portions of the wrecked plane. When the tail fell into the sea it caught fire as it must have contained petrol, which became alight on the waves. They could plainly see the two remaining members of the crew in the burning wreckage as it tossed on the waves – these two bodies have not been recovered. These two ladies are suffering badly from shock and are under Dr. Daly’s care. They got from the Hotel a bottle of brandy for which they are not making any claim. 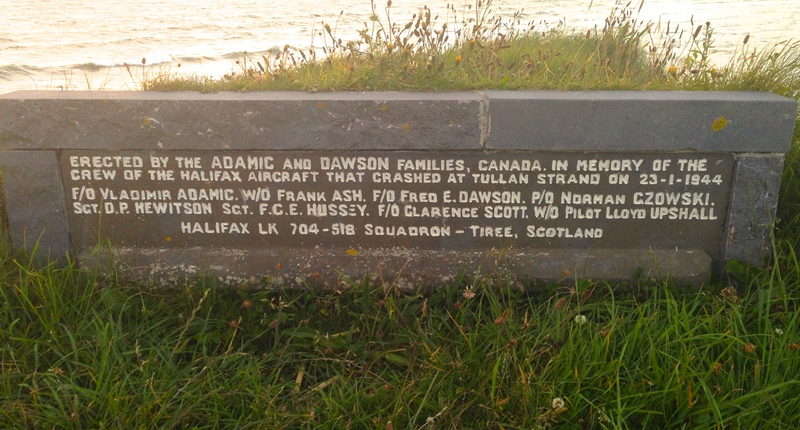 The plane was a 4 Engined Halifax bomber which was engaged on Meteorological work and was specially equipped for same.” Subsequent correspondence between one of the ladies and the Adamic family in Alberta, Canada confirmed that the high seas and full tide left it impossible to bring the plane down on the Tullan beach. Peter Rackliff confirmed that as the plane had been air borne for possibly ten hours that shortage of fuel meant that the pilot suffered a loss of power at the time when the plane needed to clear the cliff top. Had it been a few feet higher it would have come down on a reasonably flat field possibly without loss of life. Peter suggested that the plane was completely off its proper course to base in Tiree, Scotland. As the crash site was reasonably close to the Irish Army Camp at Finner the authorities were on the scene within a short time. They would have alerted Dr. Daly who lived in Ballyshannon as well as organising medical and spiritual aid. Fr. Frank Little of St. Joseph’s Orphanage, Bundoran and Chaplain to the Finner Irish Army Camp gave spiritual aid to the dead and dying at the scene. On the body of Vladimir Adamic he found his address and a set of Rosary beads. The late Fr. 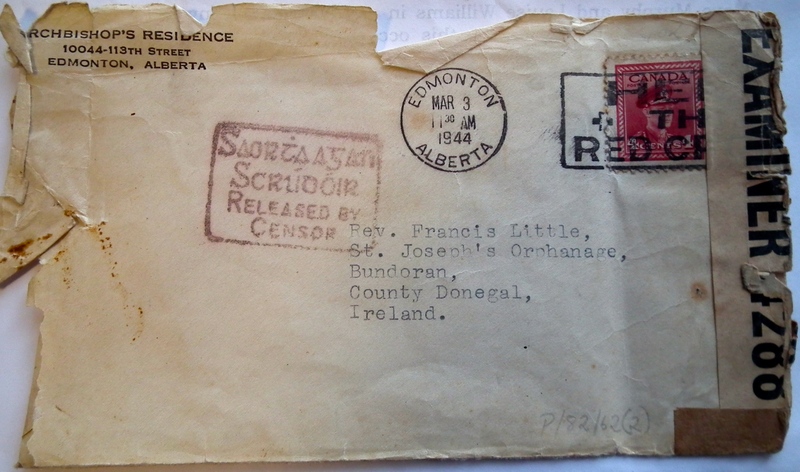 Little wrote a letter to the Archbishop of Edmonton, Alberta, some years ago I managed to salvage a copy of the letter sent by Archbishop D.H. Macdonald to Fr. Little. Your letter of January 28 to hand about ten days ago, telling of the tragic accident in which one of our boys lost his life. I have given the family all the information I could regarding the spiritual attention you so kindly gave him, and the kind services rendered by this young man before your arrival. The parents are still under the impression that he was killed in active service, which is doubtless true in a sense. They were very pleased to hear that he had his rosary with him. He was always a good boy, and so are the rest of the family. They are of the Greek Ukrainian rite, though they always attended our services because of the distance to their own church. I shall keep your letter so as to be able to give them a little more information whenever the time is suitable. I wish to extend my sincere personal thanks for the service you rendered though I know very well you would do the same irrespective of expressions of gratitude from those concerned. My very sincere thanks also to the young man who recited the act of contrition in the ears of each one of the victims; also to the two young ladies who watched the accident, and who while perhaps unable to do as much directly, offered, I am sure, a very earnest prayer for God’s mercy on the souls snatched so suddenly from this life. 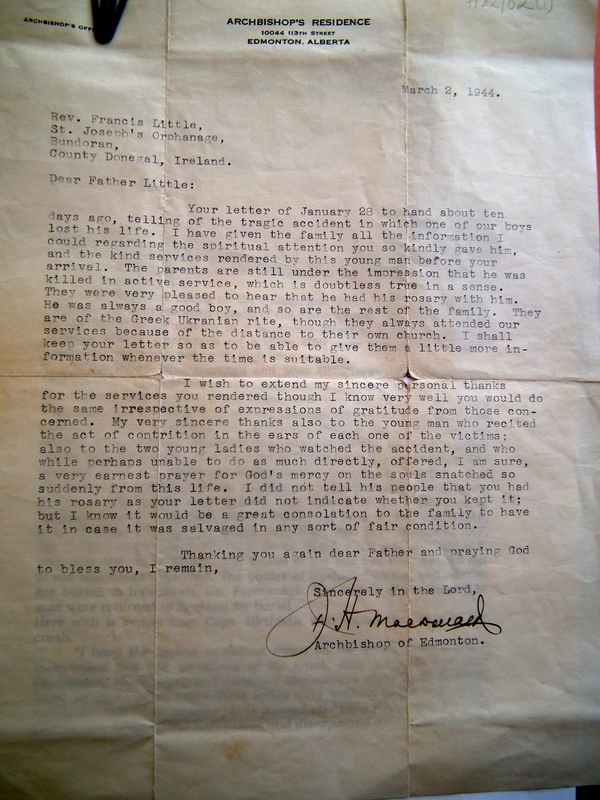 I did not tell his people that you had his rosary as your letter did not indicate whether you kept it; but I know it would be a great consolation to the family to have it in case it was salvaged in any sort of fair condition. Sincerely in the Lord, D.H. Macdonald. Archbishop of Edmonton. My Note; The rosary I am sure would have been placed in the coffin of Vladimir as is the custom in Ireland. UTV presenter Paul Clark hosted a series of programmes called We Were Brothers Too and episode 3 featured the crash memorial at Tullan. We are grateful to Paul and UTV for allowing us to isolate this clip to post online as part of our website. Watch it below. In May 1995 the Halifax plane came into the news again when due to shifting sands part of the wreckage was uncovered again. Fred Dawson was a young man of 19 years when he was killed, his wife Maureen gave birth to son who was never to see his father. Maureen remarried and became Mayo Murphy. About ten years ago she came on a coach tour to Ireland and planned to visit the grave of her young husband. It took some time to discover where Irvinestown was and get a taxi to the town. In the Church of Ireland cemetery there are two sections of war graves and one in the Catholic Cemetery. Mayo eventually located the grave of Fred in the section at the back of the Church of Ireland. In the year 2,000 – Mayo once again returned to Ireland on a coach tour this time accompanied by Louse Williams, sister of Vladimir Adamic. This time they were better organised and they made contact with Breege McCusker of Irvinestown, the well known historian and author who specialises in the World War 11 period in Fermanagh. As Breege had other commitments on the day she asked me to be the guide to the Canadian visitors. I collected them from the coach at Belleek Pottery brought them to Irvinestown where we met with Breege and first visited the grave of Fred Dawson and then went on to the grave of Vladimir Adamic who is buried in the Catholic cemetery. The ladies placed flowers on the graves of both men. Next we travelled to Bundoran to see the crash site; there Marilyn Fergus made us welcome and accompanied us to the actual site where more flowers were placed. We then discussed the possibility of having a memorial erected on the site in memory of the Halifax crew. 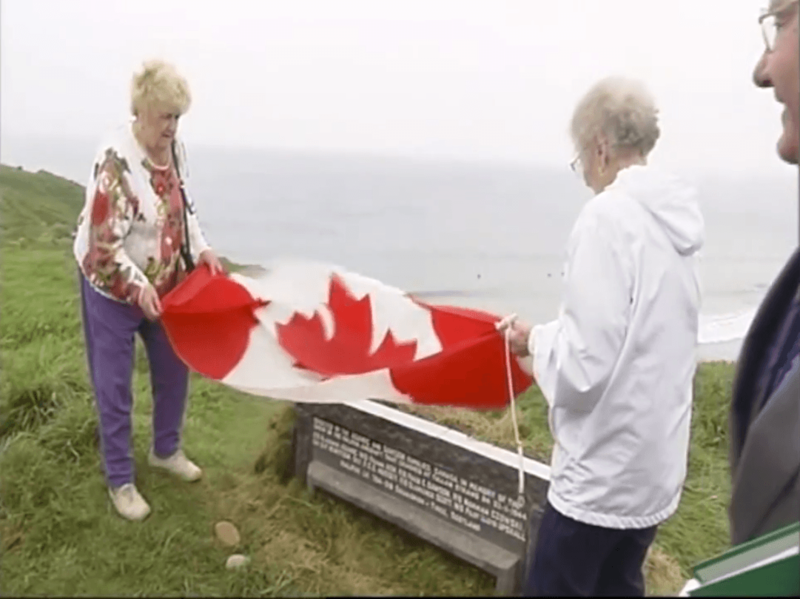 With donations from the both families and the support of the Bundoran Urban Council it became a reality and the stone was soon in place on the cliff top overlooking Tullan Strand. On Thursday 12th September 2002 the stone was unveiled by Mayo Murphy and Louise Williams in a moving ceremony attended by almost 200 guests. 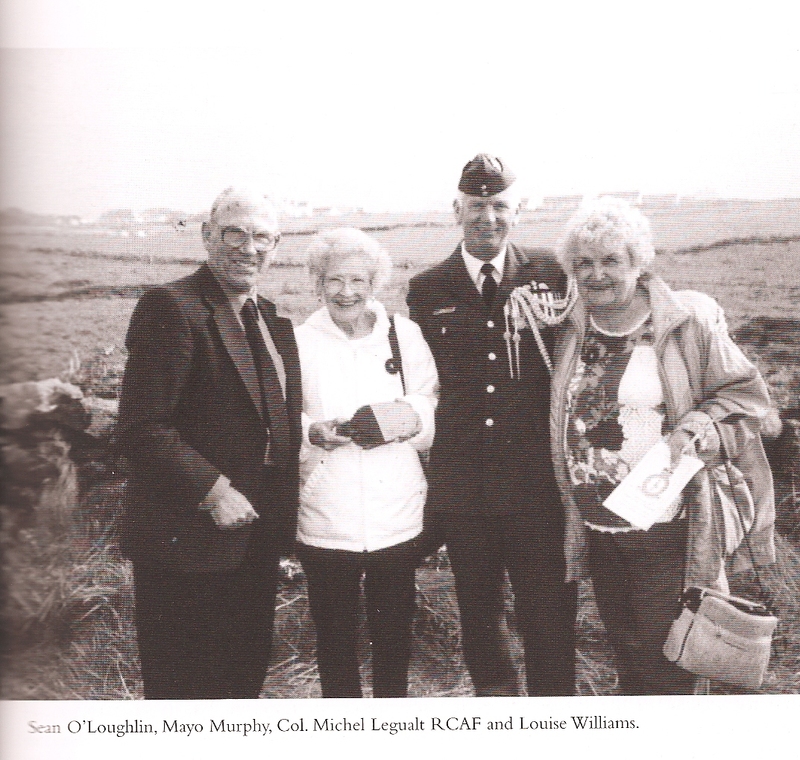 Mayo on this occasion was accompanied by her daughter Shauna Murphy, the Canadian Government and Air Force was represented by Colonel Michel Legualt. The Irish Army from nearby Firmer Camp was represented by the Commanding Officer – Lt. Coln. McKeown and Commandant Sean Curran. The Guard of Honour was provided by men from Finner Camp and the Colour Party consisted of retired ex-service men. The Chair Person of the Bundoran Urban Council hosted the ceremony which was attended by council members and local dignitaries. The prayers of the ‘Order of Service’ were read by clergy from the local Churches including Fr. Alan Ward, Chaplain to the 28th Infantry Battalion, Finner Camp. An Army Bugler Played the Last Post and a helicopter from Finner did a Fly Past carrying the Maple Leaf Flag of Canada. This moving ceremony ensured that the young men who lost their lives in 1944 shall never be forgotten by the people of Bundoran and the many visitors who stop and read the names inscribed on the memorial stone.